On August 9th, I attended G-Shock's multimedia press conference at Manhattan Center, including a meet-and-greet with the G-Shock athlete roster and the creators of the legendary timepiece. Attendees were taken through a retrospective of G-Shock’s innovative technology and previewed upcoming product releases. New collaboration models between Eric Haze, DGK, Clot and Burton were showcased in addition to limited edition 30th Anniversary tribute models set to hit stores later this year. 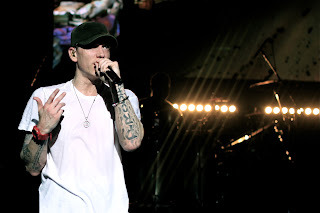 The festivities continued with an exclusive 30th Anniversary after party with Slaughterhouse opening for Eminem, who took the stage for a private concert following the news of a G-Shock and Eminem collaborative timepiece that will be released in Fall of 2013.